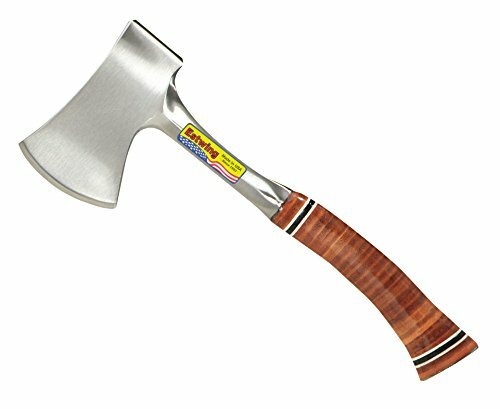 Estwing's world famous E14A 12-inch Sportsman's Axe is the choice of outdoorsmen everywhere. Both the head and handle of the axe are forged in 1-piece and are fully polished. This classic axe offers unsurpassed balance and temper. It has a genuine leather grip that is sanded and lacquered for a beautiful finish. This axe also comes with an attractive rugged nylon sheath. It has a tempered 2-3/4 in. cutting edge for easy cutting. A must for all campers and outdoorsman alike! Estwing Axes are proudly made in Rockford, IL. Protect your eyes from flying particles and dust. Always wear safety goggles.